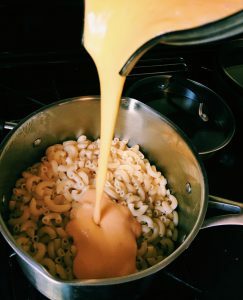 Memorial Day is here and it’s time for you to wow the backyard /potluck / BBQ crowd with Butternut Squash Mac N Cheese, a kid-tested and kid-approved hit. In this lightened up version of the traditional dish, over half the cheese is replaced with a delicious squash sauce, created by roasting butternut squash and onions until golden and sweet, then puréeing until rich and creamy. The result is a savory, gooey, and vitamin-packed sauce that, when combined with cheddar and Parmesan, will make your taste buds melt. 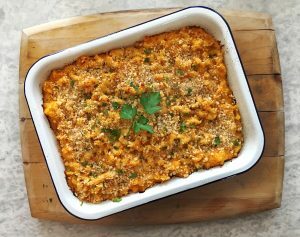 Lower in saturated fat and higher in nutrients, Butternut Squash Mac N Cheese is still comforting without the uncomfortable calories. Memorial Day is here and it’s time for you to wow the backyard /potluck / BBQ crowd with Butternut Squash Mac N Cheese, a kid-tested and kid-approved hit. In this lightened up version of the traditional dish, over half the cheese is replaced with a delicious squash sauce, created by roasting butternut squash and onions until golden and sweet, then puréeing until rich and creamy. The result is a savory, gooey, and vitamin-packed sauce that, when combined with cheddar and Parmesan, will make your taste buds melt. 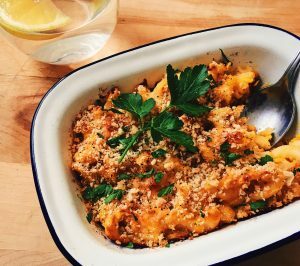 Lower in saturated fat and higher in nutrients, Butternut Squash Mac N Cheese is still comforting without the uncomfortable calories. Preheat oven to 400° Fahrenheit. 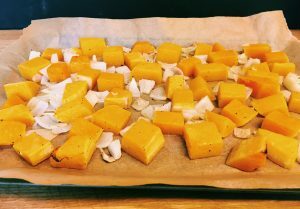 Peel, de-seed, and cut butternut squash roughly into 1-inch cubes. Chop onion roughly into small chunks. Toss squash, onion, and olive oil in a mixing bowl, then place on a baking sheet lined with parchment paper. Bake for 20 minutes or until squash begins to brown around the edges. In the meantime, boil 5 quarts of water. Add elbow macaroni and cook for 10-12 minutes. Remove from heat and drain. 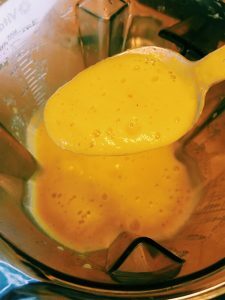 To create squash sauce, place roasted vegetables, milk, salt, pepper, nutmeg, and red pepper flakes in a blender and blend until the mixture is smooth and creamy. Combine squash sauce, cheddar cheese, and 1 cup of Parmesan to the drained macaroni. Spray an oven-safe 9” x 13” casserole dish with cooking spray. Add macaroni mixture. Top with breadcrumbs and the remaining ½ cup of parmesan cheese. Bake at 400° Fahrenheit for 25 minutes, or until a golden crust forms. Garnish with fresh minced parsley and black pepper.